Gogh, Vincent van, 1853-1890. 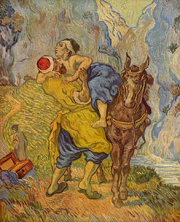 Good Samaritan, from Art in the Christian Tradition, a project of the Vanderbilt Divinity Library, Nashville, TN. http://diglib.library.vanderbilt.edu/act-imagelink.pl?RC=54697 [retrieved April 20, 2019]. Original source: https://lh3.googleusercontent.com/-JxomvlRi2uo/SDTc3ruAVoI/AAAAAAAANxw/L07CjJU2AOo/s512/The%252520Good%252520Samaritan%252520by%252520Van%252520Gogh.jpg.